Department of Breast Pathology and Research Laboratory, Key Laboratory of Breast Cancer Prevention and Therapy (Ministry of Education), National Clinical Research Center for Cancer, Tianjin Medical University Cancer Institute and Hospital, Huanhuxi Road, Tianjin 300060, China. Purpose: Polo-like kinase 4(PLK4) is an important evolutionarily regulator involved in centrosome duplication. We here investigated the expression of PLK4 mRNA and PLK4 in breast cancer, and evaluated its predictive value for response to taxane-based neoadjuvant chemotherapy. Method: The PLK4 mRNA expression was measured in breast cancer tissues and corresponding normal breast tissues from 30 breast cancer patients by quantitative real-time polymerase chain reaction (PCR).The association of the expression of PLK4 with clinicopathological parameters and prognostic significance was evaluated in 154 cases of invasive breast cancer. In addition, we immunohistochemically examined the changes of PLK4 expression in biopsy and postoperative tumor specimens of another 64 breast cancer patients who received taxane-based neoadjuvant chemotherapy. Results: The level of PLK4 mRNA expression in cancerous tissues had a significant difference compared to the corresponding normal breast tissues (P=0.021). There is a correlation of PLK4 expression with higher incidence of lymph node metastasis and distant metastasis or surrounding recurrence (P=0.043; P=0.006). High PLK4 expression was found to be a detrimental prognostic factor measured by overall survival (OS) (P=0.003) and progress-free survival (PFS) (P=0.003). Moreover, the results demonstrated that PLK4 expression was a negative predictor of response to taxane-based neoadjuvant chemotherapy (rs= - 0.253, P=0.044). Conclusion: The findings of this current study indicated that PLK4 expression in breast cancer could be a potential prognostic factor and a negative predictor of response to taxane-based neoadjuvant chemotherapy. Keywords: Polo-like kinase 4 (PLK4), Breast cancer, Neoadjuvant chemotherapy, Survival, Resistance. Polo-like kinase 4(PLK4), an important evolutionarily regulator involved in centrosomes duplication, is structurally distinguished from other members of polo-like kinase family . Overexpression of PLK4 can induce centrosome amplification and chromosome instability , which are hallmarks of cancer cells, and contribute to tumor aggressiveness [3, 4]. Given the fact that the features frequently presented in cancers, some studies have devoted to demonstrating the mitotic kinase activities in human tumors, including colorectal, gastric, and hepatocellular carcinoma [2, 5, 6]. However, no studies of PLK4 expression and resultant activities have been reported in breast cancer. Neoadjuvant chemotherapy for breast cancer is a supplement therapeutic modality that can reduce the tumor sizes, reduce node and distant micro-metastases, and improve operability . The taxane-based chemotherapy is commonly used [8, 9], for example taxane and anthracycline. However, the regimen just has benefit to a portion of patient population, affecting their overall clinical outcome . Taxanes can kill cancer cells or inhibit the proliferation of cancer cells through interfering with microtubule functions. Moritz and Agard reported that γ-Tubulin is thought to be responsible for microtubule nucleation by forming a multiprotein ring complex (γ-TuRC) , and PLK4 is an upstream regulator for γ-tubulin, which is dependent on format of the γ-tubulin-containing structure . Thus, it is conjectured that PLK4 is possibly involved in chemo-resistance. The aim of this current study was to investigate PLK4 expression in breast cancer and to evaluate its predictive value for response totaxane-based neoadjuvant chemotherapy. 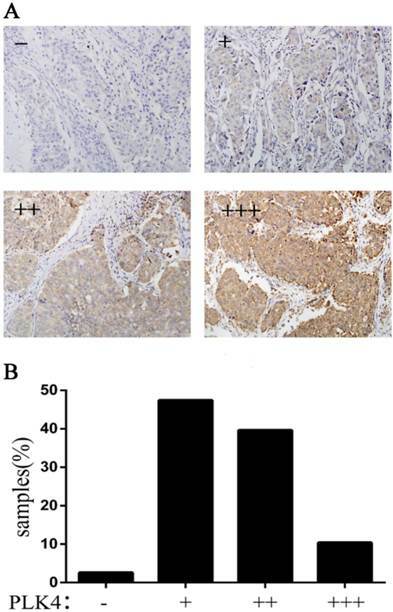 Therefore, we examined whether PLK4 aberrantly expressed in breast cancer by immunohistochemistry and, and evaluated the relationship of PLK4expression with the response totaxane-based neoadjuvant chemotherapy. In this study, we selected randomly 154 cases of invasive breast cancer patients who were diagnosed from January 2004 to December 2009 were retrieved from the archive of Tianjin University Cancer Hosptial (Tianjin, China). The diagnose of all cases and lymph node metastasis were evaluated in 4 µm sections, stained hematoxyline and eosin, by two experienced pathologists (Fangfang Liu, Li Fu). Histologic grade was assessed according to the Bloom and Richardson grading system . The clinicopathological information of patients is showed in Table 1. In addition, we selected another 64 patients hospitalized from October 2005 to December 2010, who were diagnosed with invasive breast cancer by 14-gauge core needle biopsy and completed the taxane-basedneoadjuvant chemotherapy (consisted of 2 to 8 cycles of TE) combining with chemotherapy regimen without local or systemic treatment before surgery. The specimens were collected from each patient's core needle biopsy of primary breast tumor before neoadjuvant chemotherapy and corresponding matching postoperative tumor tissues. Correlation of PLK4 expression with clinicopathological parameters of breast cancer. ☨Some missing data. ‡Some patients did not accept chemotherapy. Molecular subtypes of the tumors were authenticated through additional immunohistochemistry performed on serial tissuesections using the standard procedures according to our previous studies [14, 15]. Breast cancer tissues and corresponding normal breast tissues from breast cancer patients (n=30) were obtained from Tianjin University Cancer Hosptial (China). The total RNA was extracted using RNeasy Plus Mini Kit (Qiagen, Valencia, USA) and converted to cDNA using PrimeScript RT Master Mix Kit (Takara, Otsu, Japan) following the manufacturer's protocol. The quantitative real-time PCR was performed with an Bio-Rad CFX96 real-time PCR system using SYBR Premix Ex Taq IIKit (Takara, Otsu, Japan) with the following thermal cycle protocol: (1) 95℃ for 30 s; (2) 95℃ for 5 s, 40×; (3) 60℃ for 34 s, 40×. The following PCR primers were used: 5'- CCT TAT CAC CTC CTC CTT C-3' and 5'- CCA AGT CCT TCA TTT GTA ACC-3' for PLK4 and 5'- ACA TCA TCC CTG CCT CTA C-3' and 5'- CCT GCT TCA CCA CCT TCT-3' for GAPDH. The relative amounts of PLK4 transcript were normalized to those of the GAPDH transcript. The T/N values were measured by dividing the normalized transcript amounts in breast cancer tissues by which in corresponding normal breast tissues. Immunohistochemical staining was performed using standard procedures. Briefly, 4µm tissue sections were dewaxed and subsequently rehydrated using xylene and graded alcohol washes.Antigen retrieval was performed at 121 ℃ for 2 min, using citrate buffer (pH 6.0). After serial blocking with hydrogen peroxide and normal goat serum, the sections were incubated with primary polyclonal antibody against PLK4 (Abcam, ab137398, polyclonal, 1:100 dilution) for 16h at 4 ℃. Then, the sections were sequentially incubated with biotinylated goat anti-mouse immunoglobulin and peroxidase-conjugated streptavidin. Upregulation of PLK4 mRNA expression level in human breast cancer. 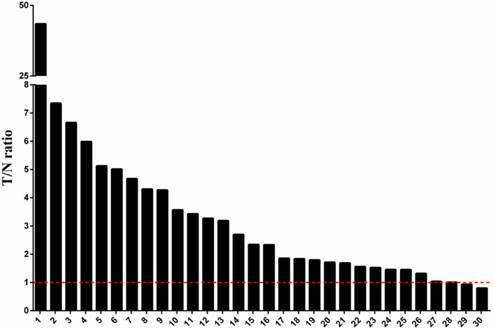 The mRNA expression level of PLK4 was compared in cancerous tissues and corresponding normal breast tissues from 30 breast cancer patients using a quantitative real-time PCR. After normalizing the amounts of PLK4 transcripts to those of the GAPDH transcripts, the T/N values were measured by dividing the normalized transcript amounts in breast cancer tissues by which in corresponding normal breast tissues. The stained PLK4 was found in the cytoplasm of tumor cells (Fig.1), hence, cells were considered positive for PLK4 when a clear-cut brown staining was observed in cytoplasm. Visual evaluation was conducted for estimating the percentage of positive tumuor cells and the intensity of staining. The intensity of staining was graded as follow: 0, no staining; 1, light staining; 2, moderate staining; 3, strong staining. The final score was histological score (H-score), which is characterized by multiplying the percentage of positive tumor cells by the intensity of staining. The H-score ≤ median was regarded as low expression, otherwise was regarded as high expression. According to Miller and Payne histologic grading system, the response to chemotherapy was classified into five grades: grade 1, no change or some alteration to individual malignant cells but no reduction in overall cellularity; grade 2, minor loss (up to 30%) of cancer cells but overall cellularity remains high; grade 3, reduction of 30% to 90% of cancer cells; grade 4, more than 90% loss of cancer cells but small clusters or widely dispersed individual cancer cells remains; grade 5, no malignant cells identifiable in sections from the site of the tumor consisting of vascular fibroblastic stroma, often containing macrophages; however, ductal carcinoma in situ (DCIS) may be present. In this study, grade 1 was regarded as having no response to chemotherapy, grades 2 and 3 were regarded as having partial response, and grades 4 and 5 were regarded as having good response. Statistical analysis was performed with SPSS 19.0 software (SPSS, IBM). Wilcoxon matched pairs test was used to detect the difference of PLK4 expression level between the cancerous tissues and the corresponding normal breast tissues. The survival curves (PFS, OS) were drawn using Kaplan-Meier estimates and compared using log-rank tests. Significant prognostic factors were found by using univariate and multivariate Cox-regression analysis. Spearman's Rank-Correlation test was performed to demonstrate the association between PLK4 expression and response to taxane-based neoadjuvant chemotherapy. χ2 test was used to evaluate the changes of PLK4 expression before and after neoadjuvant chemotherapy. A two-side P<0.05 was considered as an indicative of statistical difference. We examined the expression of PLK4 mRNA in 30 breast cancer patients and calculated the ratio of the level of PLK4 mRNA expression in cancerous tissues to the level in the corresponding normal breast tissues (T/N ratio). In Fig.1, we could clearly find that the expression of PLK4 mRNA was upregulated in 26 (86.7%) of the 30 patients, and only 2 cases (6.7%) showed downregulation of PLK4 mRNA expression. Moreover, the PLK4 expression level in cancerous tissues had a significant difference compared to the corresponding normal breast tissues (P=0.021). The PLK4 expression in 154 breast cancer samples was examined by immunohistochemical staining. The samples were divided into four groups based on the staining intensity and the percentage (Fig. 2A). It is clear that only 2.6% of samples showed no expression of PLK4 (Fig. 2B). PLK4 expression in invasive breast cancer. A: the specimens were divided into four groups according to the staining intensity and the percentage; B: the percentage of the four groups. In order to study the correlation of PLK4 expression with clinical characteristics in breast cancer, several clinicopathological parameters were analyzed. The results showed that PLK4 expression had a correlation with higher incidence of lymph node metastasis and distant metastasis, or surrounding recurrence (P=0.043;P=0.006)(Table 1; Fig.3A and 3B). However, no significant correlation was found between PLK4 and other parameters, including age, tumor size, histological grade, ER status, PR status, HER2 status, and molecular subtypes (Table 1). High PLK4 expression was found to be a detrimental prognostic factor measured by OS (P=0.003) and PFS (P=0.003) (Fig. 3C, 3D). Univariate Cox-regression analysis also confirmed that high expression of PLK4 was an unfavorable predictor of OS (P=0.010) and PFS (P=0.004), in addition to the demonstration of prognostic significance of lymph node status. Negative ER and PR status were unfavorable factors of OS (P=0.012, P=0.035), but not of PFS (P=0.179, P=0.668) (Table 2). Univariate Cox-regression analysis for OS and PFS. Multivariate Cox-regression analysis demonstrated that high PLK4 expression was an indicator for worse PFS (P=0.007), while the association with OS was not proved to be significant (P=0.088). In addition, it could be deduced from table 3 that Lymph node status is an unfavorable prognostic factor of PFS (P=0.019), while ER and HER2 status were found in OS (P=0.042, P=0.035). It can be seen from table 4 that 21 patients showed a good response, 32 patients had a partial response, and 11 patients showed no response among all 64 patients who had completed with preoperative taxane-based neoadjuvant chemotherapy. Spearman's Rank-Correlation test was performed to examine the relationship between PLK4 expression and response to taxane-based neoadjuvant chemotherapy. The results showed that PLK4 expression was a negative predictor of response to taxane-based neoadjuvant chemotherapy (rs= - 0.253, P=0.044). 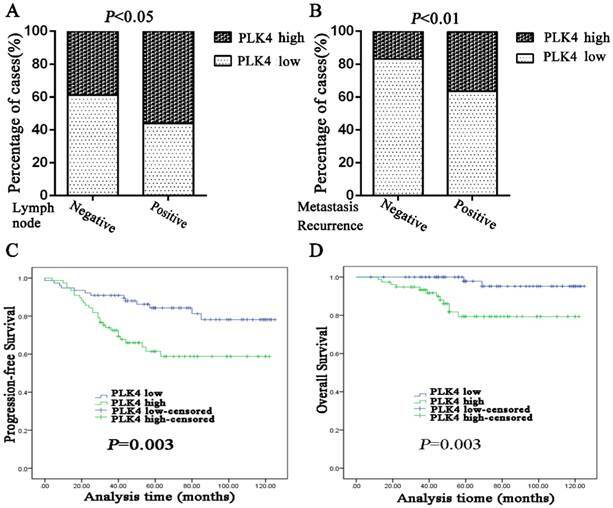 Compared to PLK4 expression at pre-neoadjuvant chemotherapy, PLK4 expression was found have a significant change overall at post-neoadjuvant chemotherapy (P=0.003) (Fig. 4A). Further analysis showed that there were no significant changes of PLK4 expression between the biopsy and tumor specimens of breast cancer patients who had no response to taxane-based neoadjuvant chemotherapy (P=0.611), while there was a significant decrease in the patients with partial response or good response (P=0.031, P=0.008) (Fig. 4B, 4C, 4D). Multivariate Cox-regression analysis for OS and PFS. The relationship between PLK4 expression and response to taxane-based neoadjuvant chemotherapy in 64 paired specimens. Note: Statistical analysis was used Spearman's Rank-Correlation test (n=64). Specimens were collected from each patient's core needle biopsy of primary breast tumor before neoadjuvant chemotherapy. PLK4 overexpression indicates high risk of lymph node metastasis and distant metastasis or surrounding recurrence, and poor prognosis in breast cancer. Lymph node status (A) and metastasis or recurrence status (B) was analyzed based on the PLK4 expression which was divided into low or high by the median values. PFS (C) and OS (D) curves were generated based on the PLK4 protein expression statuses in 154breast cancer samples. 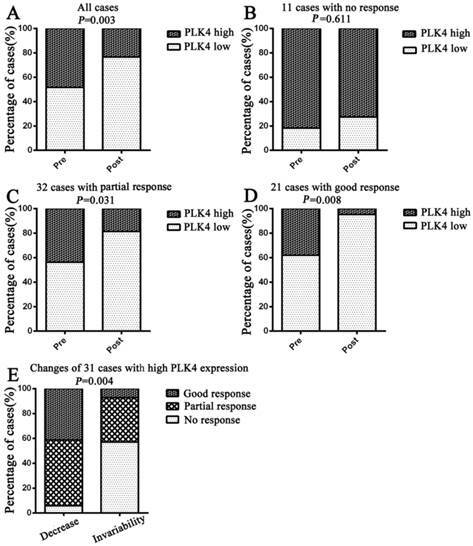 Changes of PLK4 expression before and after taxane-based neoadjuvant chemotherapy. Changes of the percentage of low or high PLK4 expression were examined in all cases(A), cases with no response(B), cases with partial response(C) and cases with good response(D). Cases with high PLK4 expression before neoadjuvant chemotherapy were particularly analyzed in (E). The functions of PLK4 identified by current date are related to its fundamental role in diverse mitotic events, including centrosomes duplication, cell spreading, motility, and cytokinesis [17-21]. In early G1 phase, PLK4 regulates centriole duplication through autophosphorylation, while limits centriole duplication to once per cycle through degradation of PLK4 by a negative feedback loop [22, 23]. PLK4 initiates and catalyzes centriole duplication and elongation by interacting with the cyclin-dependent kinase CDK2, CP110, and the PLK4 downstream regulator spindle assembly 6 homolog (SAS6) throughout S phase . However, the factors regulating the PLK4 gene expression have not been fully understood. Some studies have reported that SAPK pathways and P53 cooperatively suppress PLK4 activity [24-26], and the two pathways are frequently inactive in malignant tumors. NFκB controls the expression of PLK4, and PLK4 may be a new NFκB target gene, providing a direct link between NFκB and centrosome duplication . PLK4 expression status has been previously reported in colorectal cancer , gastric cancer , and hepatocellular carcinoma . However, PLK4 expression status was different among these kinds of cancers. PLK4 overexpressed in colorectal cancer and gastric cancer, while had low-expression levels in hepatocellular carcinoma. Some reports has demonstrated that PLK4 is highly expressed in breast cancer tissues or cells [28, 29], but the role of PLK4 in breast cancer has not been thoroughly elucidated. In the present study, we investigated the PLK4 expression status and its prognostic value in breast cancer, and determined the relationship of PLK4 expression with clinicopathological parameters and response to taxane-based neoadjuvant chemotherapy of breast cancer patients. Results indicated that the expression of PLK4 mRNA was commonly upregulated in breast cancer, and PLK4 was highly expressed in breast cancer tissues and significantly associated with lymph node metastasis and distant metastasis or surrounding recurrence. In addition, Kaplan-Meier survival analysis showed that high expression PLK4 was an unfavorable prognostic factor by both PFS and OS. Moreover, PLK4 expression status was identified as a risk factor for both PFS and OS in Univariate Cox-regression analysis, while only for PFS in Multivariate Cox-regression analysis. Our results suggested that PLK4 might play an important role in breast cancer invasion and metastasis, and PLK4 could be a potential prognostic factor of breast cancer. Even though there is a scarcity of data investigating the putative role of PLK4 in breast cancer; we still could find evidence to support its contribution to breast cancer biology. Jacqueline et al. demonstrated that PLK4 mRNA levels were significantly higher in breast cancer cells than their normal tissue counterparts by using a quantitative RT-PCR, and PLK4 was overexpressed in 26%of all breast cancer tumors by examining the microarray of breast cancer. In addition, they found breast cancer cells might be predominantly dependent on PLK4 for survival . Rosario et al. revealed that PLK4 facilitated breast cancer cells migration, and their findings may promote an association between increased PLK4 expression, cancer progression and death from metastasis in breast cancer patients . In addition, PLK4-interacting proteins may also support this point. For example, Ect2, binding and phosphorylating by PLK4, is a component of the Mamma Print genetic signature that predicts the recurrence risk of breast cancer . In short, despite the different adopted methodologies, the above studies' data are consistent with ours. Furthermore, we investigated the response of PLK4 in taxane-based neoadjuvant chemotherapy for the first time, and found that PLK4 expression was a negative predictor of response to taxane-based neoadjuvant chemotherapy. Taxanes such as paclitaxel and docetaxel highly interfere with microtubule functions and have been used in many malignant tumors. While taxanes treated a variety of tumors successfully, some patients did not benefit from this treatment or even insensitive to further treatment. Although the mechanisms behind the insensitivity of tumor cells to taxanes in these patients is not well understood, cell culture studies have identified some α-tubulin and β-tubulin mutations which contribute to the resistance to taxanes [30, 31]. γ-Tubulin is responsible for microtubule nucleation by forming a multiprotein ring complex (γ-TuRC) . PLK4 is an upstream regulator for γ-tubulin and dependent on formatting of the γ-tubulin-containing structure . Our results indicated that the PLK4-γ-tubulin axis maybe a novel mechanism for the resistance to taxanes which needs further investigation. Indeed, we did not find the changes of PLK4 expression between the biopsy and tumor specimens of breast cancer patients with no response to neoadjuvant chemotherapy were not found, however, it was significantly changed in the patients with partial response or good response. It has been reported that inhibitors of PLK4 expression might be a potential anticancer agents . Thus, targeting PLK4 with inhibitors could be used in breast cancer therapy, and may overcome the resistance to taxane-based chemotherapy, especially when PLK4 was highly expressed in the breast cancer. In summary, we demonstrated that overexpression of PLK4 may playan important role in breast cancer invasion and metastasis, and PLK4 could be a potential prognostic factor of breast cancer. Moreover, PLK4 inhibitor may function as a potential anticancer agent, and overcome the resistance to taxane-based chemotherapy for breast cancers. We thank Lanjin Zhang (Gastrointestinal and Liver Pathology, University Medical Center of Princeton at Plainsboro, Rutgers University, Plainsboro, USA) for expert comments. This work was supported by grants from the National Natural Science Foundation of China (Grant No.30930038, 81202101). Corresponding authors: Li Fu and Fangfang Liu, Postal address: Huanhuxi Road, Tiyuanbei, Hexi District, Tianjin300060, China. E-mail: fulijybcom; lef527com Telephone Number: +86-22-23340123-6006 Fax Number: +86-22-23340123-6019.